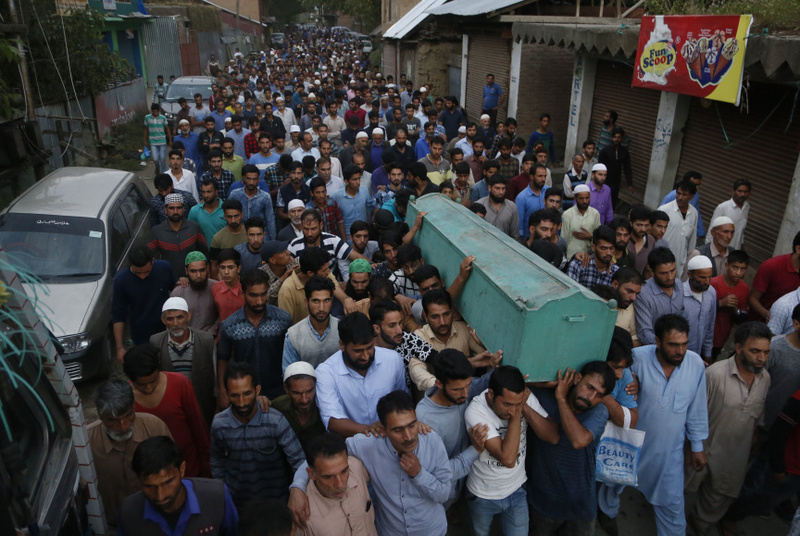 SRINAGAR, India (AP) — Rebels fighting against Indian rule ambushed a group of police officials and killed four of them on Wednesday in the disputed Himalayan region of Kashmir, police said. Separately, two Kashmiri rebels were killed in a gunfight with government forces, triggering clashes in which at leasat 40 people were injured. The officials were visiting a workshop to get a police vehicle repaired when militants attacked them with gunfire in a suburb of southern Shopian town, police said. The policemen were wounded and died later in a hospital. Also on Wednesday, a gunbattle erupted after government forces raided a neighborhood in southern Anantnag town on a tip that a few rebels were hiding there, police said. Two local militants, including a rebel commander, were killed in the fighting. Anti-India protests and clashes erupted in the area as news of the killings spread. Government forces fired shotgun pellets and tear gas at stone-throwing protesters demonstrating against Indian control over Kashmir. Local residents and medics said at least 40 people were injured. In recent years, mainly young Kashmiris have displayed open solidarity with rebels and sought to protect them by engaging troops in street clashes during military operations. Both India and Pakistan claim the divided territory of Kashmir in its entirety. Most Kashmiris support rebel demands that the territory be united either under Pakistani rule or as an independent country, while also participating in civilian street protests against Indian control. Rebels have been fighting against Indian control since 1989. India accuses Pakistan of arming and training them, a charge Pakistan denies. Nearly 70,000 people have been killed in the rebel uprising and the ensuing Indian military crackdown.